Do you know the bee was venerated throughout human history in part because they increased crop yield, allowing big population centers and culture to grow? If we inquire into the bee, or even take a few minutes to observe one in its work, it’s possible to be humbled by the miracle of them, and it’s possible to find the inspiration to support the bees. Whether that means buying local honey, supporting organic farming, planting a garden, advocating against neonicotinoid pesticides, or contributing to bee culture, it is all helpful and necessary. 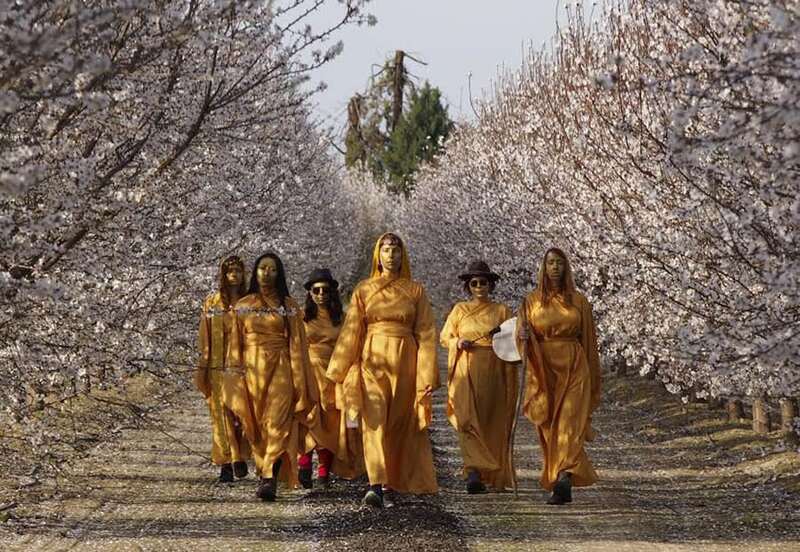 In February 2016, six women walked 100 miles through California’s Central Valley during the world’s largest forced honeybee migration, speaking with farmers and beekeepers to understand, witness, and document the major degrading of the health and immunity of the country’s hives contributing to the 44% loss of bees this past year. The exhibit “Equilibrium Rites” is inspired by a performance ritual performed with Meesh’s friends over five days. They walked 100 miles through California’s million acres of almond orchards as 80 billion bees were trucked in from around the country to pollinate. They wanted to create an artwork for the bees and were compelled to enter their world. They wanted to be with them, bear witness to this epic event, document, to talk about the bee crisis, and Meesha’s exhibit of paintings and photographs at the Hive Gallery on 7th and Spring, are a part of that documentation. It was only natural to bring the exhibit to The Hive Gallery because they are so passionate about the bees! Meesha Goldberg graduated from the College of the Atlantic on an island in Maine with a BA in Human Ecology. It was there that she fine tuned her zen and studies in the integrative lessons of nature. Born in Queens, NY, now living in Oregon, Meesha began drawing at 16 after being orphaned, creating long hours into the night with just the voice of the radio. Creating art became the companion, therapy, identity, and joy that has never left. Out of a long list of humanitarian projects including an internship at Democracy Now! during the Iraq War, Meesha now finds herself in a project that weaves together art, reality, dream, and vision. Along the walk her group of friends and fellow artists were often asked by farmers and people driving by, what in the world we were doing, out in the desert, alone, in these lavish gold costumes? Within the groups conversations about the bees and how essential they are, people often became enchanted by the message finding themselves cheering on the friends and wanting to become more involved. The Hive Gallery show runs from August 6th-26th and includes paintings as well as photographs of the walk by James Stark. co-curated with Nathan Cartwright, it encludes a sister group show called “Honey and Venom,” featuring 20+ artists all creating art inspired by the bees. Part of the proceeds will go towards the creation of an endangered bee sanctuary and educational center by Patricia Algara of the Bay Area non-profit, With Honey In My Heart. Bees are one of those areas of inquiry that offer up endless mystery and magic, making just a fraction of a teaspoon of honey in her lifetime, which is the only food with all the nutrition to sustain life.Intact jars of honey were found in the tombs of the Egyptians, and the Egyptians, too, would float hives down the Nile to pollinate crops. Equilibrium Rites is now showing at The Hive Gallery located at 721 S Spring Street.